Liberal Arts majors participating in an internship experience are encouraged to apply for The Virginia Todd Chapel Executive Internship Program. Undergraduate students selected will receive a $5,000 award to support their internship experience. Virginia (Jinnie) Todd Chapel is a 1965 Penn State graduate with a degree in English and member of the Liberal Arts Development Council. Jinnie had a successful career with the management consulting firm of Booz Allen Hamilton and later became a partner in LeapFrog Solutions, a marketing communications management firm, based in Fairfax, Virginia. Her husband, John Chapel, is a graduate of Drexel University, and today he is President and CEO of White Hall Capital LLC, a Northern Virginia-based private equity investment firm. 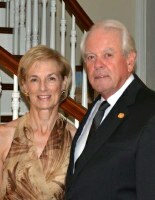 The Chapels made a leadership gift of $1 million to create The Virginia Todd Chapel Executive Internship Program. This funding, partnered with a previous gift, supports premium internships, particularly in the private sector, for Liberal Arts students who excel academically and who seek high-quality career development opportunities. Internships may be paid or unpaid, as long as applicants meet the noted eligibility requirements. To apply for the Virginia Todd Chapel Executive Internship Program, Liberal Arts majors should submit an enrichment application via the online Liberal Arts Enrichment Funds Application System. Basic Information: In the online application system, applicants MUST check the box indicating that they are applying for the Virginia Todd Chapel Executive Internship Program. Applicants will be asked to provide basic details about the internship experience (e.g. internship site, location, dates, contact names, salary, etc.) and provide short answers to questions like “What do you hope to gain from this experience,” etc. In your answers to these questions, make sure you: describe your internship (job title, name of organization, and any details regarding your position); tell us how your internship experience will support your career goals and why your internship is unique and worthy of this support; and include any financial circumstances of which we should be made aware. List of Expenses: Applicants will also be required to provide a detailed list of expenses for which funding is being requested. Acceptance Letter and Résumé: Provide a copy of your acceptance/offer letter for your internship, in addition to updated version of their résumé. Students selected as recipients of the Virginia Todd Chapel Executive Internship Program awards will receive $5,000 which will be deposited into their Penn State student bursar account the semester during which their internship takes place. More information about the disbursement of enrichment funds can be found in the Frequently Asked Questions (FAQs) section of our website. Students who are not selected for the Virginia Todd Chapel Executive Internship Program will automatically be considered for our general Liberal Arts Enrichment Funds. There is no need to submit a separate application. Applications will be reviewed after the semester deadline for which you are applying. Once all applications have been received by the semester deadline, applications will be reviewed and awarding decisions should be made within two to three weeks. Meet with the donors if they return to campus. A staff member in our office will contact you to arrange a meeting if the donors return to campus. For more information about this competitive internship program, contact the Liberal Arts Career Enrichment Network.